Download the sermon of PDF here >>>. Today we continue reading the chapter six from the Gospel according John. Remember, we discussed this theme already the last week, and it continues through the entire chapter six, namely, – if and when you search for God, when you look for Him, why do you do it? Is it because you are looking for Him, or – are you simply looking for His gifts? Today we’ll continue to meditate upon the same question. Why do you seek God? Why do you come to Him? Are you looking for the Giver of all good things, for your Creator and Redeemer Himself, or – are you simply looking for His gifts? Remember, the last time we looked at how Jesus fed 5000 and how He walked on the water. Today’s reading begins with the surprised followers of Jesus wondering where He was. Where is this guy, who just served us this gorgeous feast? As they couldn’t find Jesus they went back to Capernaum. When they found him, they said to him, “Rabbi, when did you come here?” Innocent question. But Jesus didn’t answer their question. He went to address the very reason why they’d came. “Truly, truly, I say to you, you are seeking me, not because you saw signs, but because you ate your fill of the loaves.” Remember the whole purpose of a sign is to point to a reality beyond the sign itself. They missed it. Jesus was simply saying that, yes, you ate bread, you were satiated. You obviously enjoyed it, and now you want more. But you didn’t ask the right question. Who is this man? Who can He feed five thousands with a few loaves of bread and a few little fish? These people didn’t see beyond the signs. They saw someone who could solve their problems. Let’s follow Him! At least, as long as He helps us to get what we want. This is our problem as well, and as Jesus directly told about it His followers, we need to talk about it as well. For this is how people often perceive God. That He is some kind of helper, whom we can get involved when we have problems. A bit like emergency services. You don’t need them unless there is emergency. If you are doing just fine, if you are a strong, and smart, and healthy and active person, in control of your life, bravely pursuing your goals, succeeding in life, you don’t need emergency services, right? This thinking reveals our problem, and our problem is idolatry. We all are idolaters. This is not a word we use daily so I’ll explain what is meant by it. 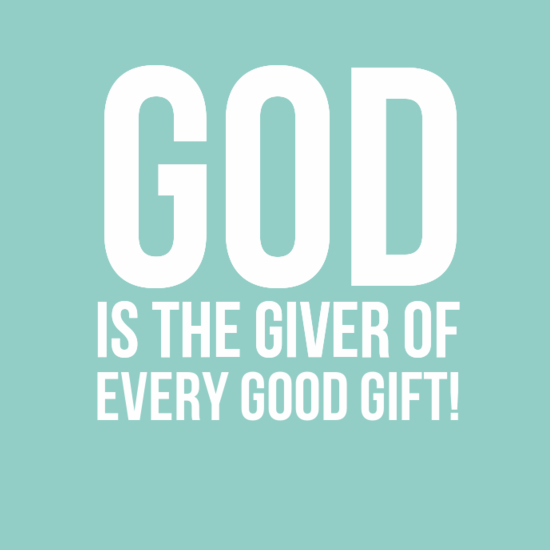 True God is the Giver of all good gifts. He is the Giver! He has created us to be with Him, to allow Him to care for us, to provide of us, to be our God. He expects us to trust Him and rejoice in His ongoing care for us. God the Father is like a loving parents. Imagine that you have a loving parent, very, very wealthy and influential parent, who loves you more than anything. He cares for you, He provides for everything you need, but what is the most important for Him? Of course, – your relationship. Being together. Enjoying one another. Now, imagine, that you are a child, who sees this parent only as a storehouse of good things, for something you may need or desire on daily bases. This parent wants to share with you His love, He wants you to be an heir of His empire, but you only look for some bread and fish. You think that will give you fulfillment. This is what so often happens to us. We want ‘bread and fish’ more than true God. ‘Bread and fish’ become our gods. It could be health, or spouse, or children, or wealth, or happiness, or career, or hobby, or something else that we desire more than to be with God our Father. We trust that these good gifts of God will give us more that the Father Himself. We expect that is will be enough to get these good things and our deepest desires will be fulfilled. This is what is meant by idolatry. Then we are not interested in true God the Father, we simply try to manipulate Him to get closer to our true gods. And if we can get closer to our true gods on our own, then we don’t need this God of the Bible at all. Why? For we already have want we truly desire. We all are idolaters, without exception. It’s just that usually we don’t thing about ourselves in these categories. We just want good things, good life, God’s gifts. We are not too interested in the Giver Himself. As Paul the apostle said: “If in Christ we have hope in this life only, we are of all people most to be pitied.” (1Co 15:19) We crave for God’s gifts, and we reject the Giver. We ignore Him. We pretend He is not here, that He is not waiting for us. Of course, our daily needs are important. Of course, we all need our daily bread. No question about it. The problem is, that we begin to think that our daily bread is all that there is. By focusing on a few gifts of God, we lose the big picture, we miss what He is actually offering us. What Jesus essentially says is: “Brothers and Sister, open your eyes! Look up! Listen to my message! I have come to bring you into my Kingdom. I am here to give you eternal live. With me. In joy and peace.” It begins here. This is what we need to hear. Don’t be fooled to hope and to ask for a little. ‘Just give me a good life without problems!’ No! Sure, it is good and needed, but that’s not all that there is. Be ready for so much more! You know well how quickly things of this world pass away. Where are all these years, where have they gone? Work for things that endure forever! Don’t settle for less. So, what must we do to get things that endure forever? This is how we often think about our relationships with God. What must I do, to get something from God? We operate this way. I’ll do for you this, then you for me that. Not so with this God. He needs nothing from you. Nothing! What could you possible give Him? He is the Creator, heavens and earth and everything in it belongs to Him. You belong to Him. What can you offer Him? There is only one thing He desires and expects from you; to turn away from your idols, from the things which you desire more than Him and to turn to your Father in heaven. Trust that if you love one true God more than anything, then all the deepest desires and longings of your heart will be fulfilled. “Seek first the kingdom of God and his righteousness, and all these things (all that you need and desire) will be added to you.” (Mat 6:33) It is that simple. He wants to make you an heir of His eternal Kingdom, He wants everything that is His to be yours as well. Open your eyes, embrace God’s offer, don’t be fooled to settle for bread and fish! Then they said to him, “Then what sign do you do, that we may see and believe you? … Our fathers ate the manna in the wilderness…” for 40 years. This is almost funny. Jesus just fed thousands. What are they asking for? What sign will you show? We know that Jesus was showing many signs and performing many miracles before the eyes of hundreds and thousands of eyewitnesses. Have you thought about why He hesitated to show a sign, when He was asked to? It has a very simple explanation. True God is not to be manipulated. We are not gods, we are not going to tell Him what to do and how to do. It doesn’t work that way. Jesus did these signs to show what His true identity was. He was true God and true man. He proved it by His resurrection from the dead. And He is not to be manipulated. They were saying that their fathers ate manna for 40 years in the wilderness. “Jesus, could you do this for us? M?” 40 years? You see, God has chosen to reveal Himself hiding behind ordinary things. That’s the most difficult for us. We expect someone with unlimited power to come with unlimited power. But He came to us as a man. As one of us. He delivered Himself to be crucified. How could these people believe that Jesus was God? All what they saw was just a man. Also today, God has chosen to come to us and to bless us hiding behind very ordinary things. We just had a baptism of little Jake. Now He is a child of God, and an heir of God’s Kingdom. Come on! It is just a water and a few words… just a ritual. Did you see the Holy Spirit coming to Jake? Did you see his sin washed away? You couldn’t possibly see it? But this is exactly what happened. This is exactly what the Holy God just did for Jake. The Kingdom of God, the eternal life was just given to him. God works through very ordinary things. Water, word, bread, wine. He speaks through us. His message is written in this old books, which doesn’t look much different than other books. You can see it only with your ears, when Christ Himself explains what is going on. You are in God’s presence right now. He blesses you with His Spirit right now. He shares His most precious gifts with you right now. Just pray for the Holy Spirit to open your eyes. Seek for Jesus first! He gives you eternal life. Yes, we can’t understand what it is, how it will be. But try to image even ourselves and this world without sin, pain, sicknesses, sufferings, brokenness, foolishness, without evil, jealousy, hatred, anger, betrayal. Only love, peace, joy, faithfulness, mutual care and kindness, generosity and excitement and perfect relationships. If you can picture this, at least a little bit, then multiply it by infinity, add to it presence of Jesus Christ Himself – this is where we are heading. This is what God the Father has prepared for you through His Son. Don’t settle for a full stomach and some kind of short term happiness in this world. Ask and Almighty God will give you. Ask for His wisdom and He will reveal you the world. Ask for His presence, and He will bring you into His family. Ask for true life, and He will give you inheritance in His eternal Kingdom. Don’t be fooled. Don’t exchange a few gifts to the Giver Himself. Search for Jesus Christ first, and everything else will be added for you.